Want to tag on Facebook? This guide will show you how tag users and pages either in a status or post, in a photo, or in an album. While writing a post or status update on Facebook, type the @ symbol, and right next to it, enter the name of the user you would like to tag: You just have to start typing the person’s name and then click on it in the list that will appear. Each time you tag a friend, this friend receives a notification with a link to the status or post in which the tag was included. They also have an option to remove the tags of themselves. With this procedure you can tag friends and people in your same groups, pages, events, and apps. You can also tag the Facebook pages that you liked. First go to the photo where you want to make the tag. Once there, click on the “Tag Photo” button that is at the right hand side near the photo or on the “Tag Photo” option that appears inside the photo once you hover the mouse over it. Once you have done that, inside the photo, click on the face of the person you want to tag, write their name, and press Enter in your keyboard. Once you have finished tagging all the people you want to tag, click on the “Done tagging” link that will be inside the photo, near its lower border. This way you will indicate what persons are in your photos. First go to the album in question. There, near the top right hand corner of the page, click on the “Tag” button. 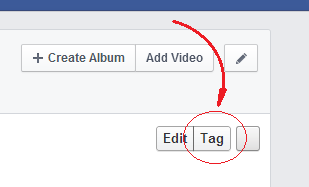 Once you have done that, in the text box that appears below the title of the album, enter the name of the friend or page that you want to tag and click on every photo in which you want to tag them. Once you have clicked on all the photos where you want to tag them, click on the “Save Tags” button, located at the right extreme of the text box in which you entered the name. You must repeat this process for every page or user that you want to tag. These are the three ways in which you can tag on Facebook.